My mission is to empower engineers and technical leaders with the tools and mindsets to perform at their highest levels. I share everything that I've learned from the world's best engineering leaders in my newsletter, so that you can create the most meaningful impact you're capable of. Join me, and discover what's possible. I can't recommend @edmondlau's Effective Engineer mailing list enough. The first email alone was life changing. Wow, @edmondlau's new book is chock full of actionable techniques and proven habits to help engineers succeed. I hope more people embrace Edmond's philosophy and techniques to make their companies and careers more successful. Master the techniques used by top software engineers to maximize their impact and make a meaningful difference. Accelerate your career growth. Spend less time grinding on tedious tasks. Turn your effort into impact. 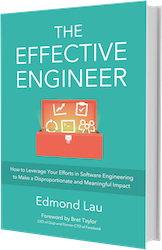 Get hundreds of actionable tips and habits in The Effective Engineer — a book that has already become required reading for many engineering teams. The last workshop, Powerful Conversations for Engineering Leaders, that I co-led with engineering-manager-turned-coach Jean Hsu sold out in a week! Learn the most valuable frameworks and tools for effective leadership that we've picked up from coaching 50+ people ranging from tech leads and managers to directors and CTOs.